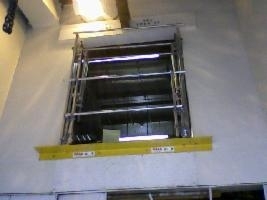 Shutter doorway with limited headroom and in an area with confined space. Swing door workshop entrance from staircase directly adjacent to the landing area. The danger of personnel falling through an open door or coming into contact with moving load. Safety procedures required doorway kept locked and a permit for use was required. Supply and installation of an Omega-Nu* model combination vertical track edge gate with fold down inner gate. part mounted on new angle extension landing plate on the wall at foot of doorway (Painted yellow in photo). Edge gate designed to raise higher than door way to improve load height clearance. Gate mechanism positioned to allow shutter door to be closed as required and with gate providing fall prevention whether open or closed, there is no need to lock the door. * Now more often superseded by the Sigma Model which is more compact for doorway applications.